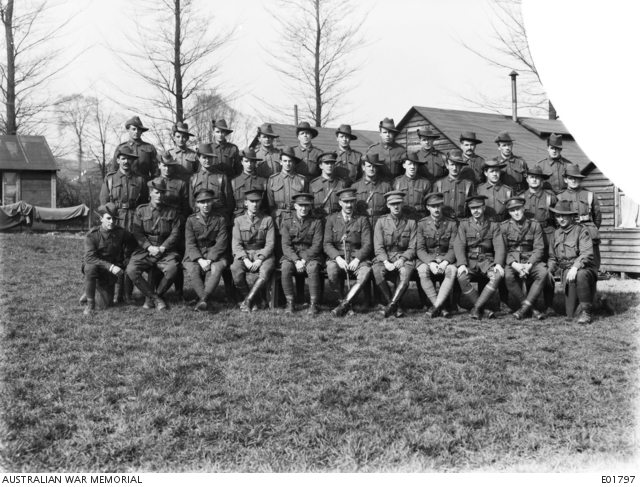 Group portrait of the officers and NCOs of the 4th Field Ambulance. 738 Corporal (Cpl) C. Edwards; 2010 Cpl J. McGregor MM; 160 Cpl A. J. Jeffery; 1040 Lance Sergeant (LSgt) J. R. Butterworth MM; 1379 Cpl F. K. Davison MM; 9571 Cpl C. W. Sanders; 1021 Cpl J. H. Hunt MSM; 5371 Sergeant (Sgt) A. J. Ride MM; 833 Cpl W. Richardson; Cpl C. P. Bull MM: 2014 Cpl J. T. O’Gilvie. Middle row: 3226 LSgt A. J. a’Court MM; 2597 Sgt L. Johns MM; 2007 Sgt J. E. McPhee MM; 5014 Staff Sergeant (SSgt) J. R. Plimer; 7654 SSgt W. B. Seymour; 1097 Quartermaster Sergeant (QMS) J. Wainwright; 1312 Warrant Officer (WO) S. V. Say; 1027 SSgt C. L. Kneebone; 1559 SSgt C. G. Marshall; 5298 Sgt C. G. Tucker MM; 245 Sgt R. A. Hammet; Sgt V. McPhee MM. Front row: 2029 Sgt H. Uren; Lieutenant (Lt) and Quartermaster H. Powell; Captain (Capt) D. Parkhouse; Capt W. Matthews; Major (Maj) B. C. Kennedy; Lieutenant Colonel H. B. Follit; Maj R. I. Furber DSO; Capt D. I. R. Smith; Capt R. L. Walters; WO H. J. Baber MM; 2061 Cpl L. A. Cleverley.